High Tech Start-up Clinked.com is proud to announce their new campaign to Crowd Fund their next-generation fully Brandable White-label Client Portal technology and have reached out to Crowdfunding platform Seedrs.com in a move to offer potential investors the opportunity of a 2.5% equity stake in this fast growing business. The SaaS company, which develops and produces a white-label file sharing, project management and client portal App for SMEs and Enterprise businesses both nationally and internationally, is seeking to attract a broad audience upon which to showcase its business model and plans in which it believes will prove a high success story in the coming years and define Clinked as the number one collaboration platform. Gaining a competitive advantage for business. This innovative collaborative technology enables fast moving start-ups and SME’s to outflank their competitors, including Corporates, that are using more limited and far more expensive technology and, combined with the White-label solution for brand identity that Clinked offers, it aims to set its customers apart from other organisations that rely on generic or basic software for their communication and project management. The objective is for early adopters of this revolutionary platform to rapidly streamline their business processes thereby gaining a valuable competitive advantage over their peers. With this state of the art new technology from Clinked, there is no minimum contract, ensuring that users can trial the platform risk free. What is really different here? This technology can be setup within minutes providing its users with a white-label Client Portal, which can be fully branded with their own website domain name, their own Mobile App and their own Desktop Sync Tool. The primary objective of Clinked has been to integrate their take on the very best Cloud-based offerings available out there, putting them all together into one simple to use cutting edge interface. Those businesses that utilise Google Docs power, Dropbox’s simplicity, Basecamps collaborative technology or Sharepoint’s flexibility should take a good look at just what this newly emerged platform has to offer. 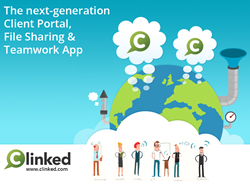 Clinked encompasses all of this.- in one easy to access platform - from File Sharing, including Google Apps integration and Social Collaboration to Online Documents, Task Management, Universal Search, Team Calendars and so much more. In this way they have been able to provide a totally comprehensive suite of powerful tools that makes team and client collaboration processes as simple, efficient and timely as possible. With no minimum contract, Clinked offers this software solution as a pay monthly option that enables all of the functionality of myriad separate file sharing and collaboration tools but in one central fully secure Cloud-based environment. There is also a free starter package for up to 3 users to enable businesses that may be starting out to experience limited file sharing and collaboration features until they are ready to upgrade to a more suitable package. Clinked have produced a sparkly new Client Portal Crowd Fund video available here which outlines the business proposal in some detail and provides an outline of just what this platform could bring to any organisation or business, particularly SME’s, across the globe. If you would like to get in touch with the team behind Clinked Click On This Link or use the contact information below. Feel free to get in touch today. Situated in Cambridge, UK and formed in 2008 Clinked holds award and industry recognition from Cisco Business innovation Gateway and Red Herring 100. This innovative SaaS is the next generation Client Portal, White-label File Sharing & Teamwork App, with thousands of customers all over the world and high ambitions for the future. Clinked.com – Thinking outside the inbox!